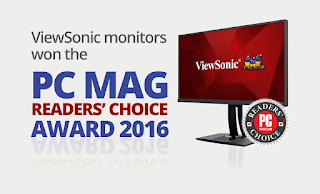 ViewSonic Corp, a leading global provider of visual solution products is recognized as this year’s PCMag Reader’s Choice Award winner for computer monitors. In its 28th year, PCMag.com readers were asked to rate products and services they use in overall product satisfaction, picture quality, ease-of-use, likelihood to recommend and reliability within the past 12 months. Being a maven in the display solutions enabled ViewSonic to grab the award comfortably. “It is an honor to be named as best for second time by consumers and reputed IT publication such as PCMag. We have worked hard to bring the best possible and quality rich products to consumers. With our dedicated employees, who are committed to making a difference in display industry, receiving this award has given us a huge boost in confidence and we are very thankful for this recognition“ said Pradeep Thamman, Country Manager at ViewSonic India. “We’re honored that the readers of PCMag have voted ViewSonic as their top computer monitor choice,“ said Jeff Volpe, Presidentof ViewSonic America. “Our product portfolio supports a wide range of display needs, right from professional graphics and video production to engineering and finance. Our newest line of XG Gaming monitors is the choice of e-sport professionals around the world. With the average ViewSonic monitors lasting for several years, it’s no surprise that PCMag.com readers value quality and performance in their monitor choice. This is truly an honor for each employee here as we celebrate 30 years of making great monitors. This year, ViewSonic celebrates 30th Anniversary and this award makes it even more meaningful. As a leading global supplier of display technologies that combine innovation, reliability and quality in its products ViewSonic’s heritage is rooted in delivering excellent performance, functional designs and advanced technologies to our customers. Email survey invitations were sent to PCMag community members, specifically subscribers to the Readers’ Choice Survey. The Readers’ Choice Awards and Honorable Mentions are then based on the subjective determination by PCMag editors, taking into account all of the ratings for each manufacturer.